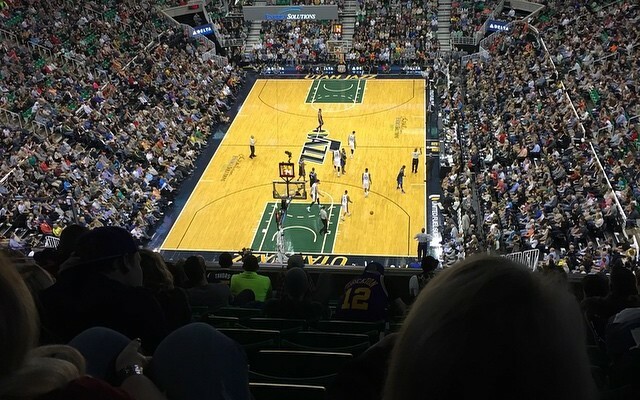 A few couple of months ago I took my son to a Jazz game. I’ll be honest, although I love basketball and I even played in high school, I never watch the NBA – not even the finals. I’m just not that interested and I don’t think the Jazz have been worth watching since the Stockton & Malone days. Really, the only reason I went was because my son got free nose-bleed tickets for playing in a Jr. Jazz basketball league. The game wasn’t really that exciting. The Jazz got smoked by the Dallas Mavericks – just as I expected. I didn’t know anyone on their team. I didn’t even realize they had a new coach! With about 2 minutes left in the game, the stadium was emptying fast. I asked my son if we wanted to go sit a little closer to the rest of the game since the lower bowl was basically empty. I know now this was mistake. First, I didn’t think he would really want to. I figured by the time we got down there, the game would be over anyway. But my son got excited and really wanted to sit down there, so I agreed. I guess it was obvious we didn’t have tickets to be there. We were walking in with 30 seconds left while most people were leaving. Honestly, I had no idea it was such a big deal. I have seen people do it at various baseball games and I’ve never seen any problems with it. I looked at my son and he still wanted to, so we did. Now there was about 5 seconds left in the game and someone was shooting foul shots. Okay, so this is the part where I really got irritated. The usher came and put his hands on my son’s shoulders and asked, “Do you like it down here?” My son just nodded his head. Seriously though, who does this guy think he is? He’s an usher at a Jazz game. He has no idea how much money I make or have, or why we were sitting in the upper bowl. Maybe if I liked watching Jazz games, and the Jazz were worth watching, I would choose to purchase lower bowl tickets. But, in my mind they are complete waste of money compared to so many other options to spend my salary. What are you thoughts? Was this guy out of line, or am I overreacting?